The 305th Operations Group is a United States Air Force unit assigned to the 305th Air Mobility Wing. It is stationed at Joint Base McGuire-Dix-Lakehurst, New Jersey. During World War II, the group's predecessor unit, the 305th Bombardment Group was one of the first VIII Bomber Command Boeing B-17 Flying Fortress units in England, and, was one of the most-decorated USAAF heavy-bombardment groups in the European Theater. 1st Lt William R. Lawley, Jr. and 1st Lt Edward S. Michael, pilots in the 364th Bomb Squadron, each received the Medal of Honor. While commanded by Colonel Curtis LeMay the 305th Bomb Group pioneered many bomber flying formations and bombing procedures that became the standard operating procedures in the Eighth Air Force. The group suffered the heaviest loss of the 14 October 1943 Schweinfurt–Regensburg mission, and for this reason, was given a Nazi flag found flying in the city when it was captured by U.S. troops in April 1945. The mission of the 305th Operations Group is to deploy worldwide from Air Mobility Command's Eastern Gateway, Joint Base McGuire-Dix-Lakehurst (JB MDL), to perform aerial-refueling and airlift missions, in support of tactical, strategic, reconnaissance, transport, and bombardment forces in high-threat and chemical-warfare environments. The group flies the C-17 Globemaster III and KC-10 Extender in support of worldwide operations. The 2nd ARS provides the United States with the Global Reach necessary to support our national security objectives, while placing an increased emphasis on squadron members' families-the unsung heroes of the unit's successful operations. The 6th Airlift Squadron is the oldest airlift squadron in the Air Force, having served with distinction since 1 October 1933. The 32nd ARS can generate, mobilize and deploy 16 KC-10 aircraft with more than 180 aircrew, maintenance and support people to fulfill a wide variety of worldwide mobility taskings. The mission of the 305th OSS is to provide information, support, and equipment to allow aircrews to accomplish their global mobility mission. The 305th Bombardment Group was activated 1 March 1942 at Salt Lake City Army Air Base, Utah. The unit trained there before moving to Geiger Field, Washington on 11 June 1942. Received intensive training at Muroc Army Air Field, California beginning in July 1942. The ground unit went by train to at Fort Dix Army Air Base, New Jersey. The ground unit sailed on the Queen Mary on 5 September 1942, and disembarked from Greenock on 12 September 1942. The aircraft assembled at Hancock Field, New York, and spent six weeks in advanced flight training. The unit received new Boeing B-17F Flying Fortress bombers, and left for the United Kingdom in October 1942 via Presque Isle Army Air Field and Gander Airport, to Prestwick Airport Scotland. The 305th Bomb Group deployed to England in September 1942 and formed at RAF Grafton Underwood as part of VIII Bomber Command's 40th Bombardment Wing. Was assigned group tail code "Triangle-G". From Grafton Underwood, the group began combat on 17 November 1942 and attacked such targets as submarine pens, docks, harbours, shipyards, motor works, and marshalling yards in France, Germany, and the Low Countries. During December 1942, the group was transferred to RAF Chelveston. On 27 January 1943, the group participated in the Eighth Air Force's first raid on Germany. During the winter of 1942-1943, the 305th was commanded by Colonel Curtis LeMay and pioneered many of the techniques of daylight bombing used by the USAAF over Nazi-controlled Europe. The 305th Bomb Group bombed the navy yards at Wilhelmshaven on 27 January 1943 when heavy bombers of Eighth Air Force made their first penetration into Germany. Through mid-1943, the group attacked strategic targets as submarine pens, docks, harbors, shipyards, motor works, and marshaling yards in France, Germany, and the Low Countries. The 305th received the Distinguished Unit Citation for a mission on April 1943 when an industrial target in Paris was bombed with precision in spite of pressing enemy fighter attacks and heavy flak. During the second half of 1943, the unit began deeper penetration into enemy territory to strike heavy industry. Significant objectives included aluminum, magnesium, and nitrate works in Norway, industries in Berlin, oil plants at Merseburg, aircraft factories at Anklam, shipping at Gdynia, and ball-bearing works at Schweinfurt. A second Distinguished Unit Citation was awarded to the 305th for withstanding severe opposition to bombing aircraft factories in central Germany on 11 January 1944. The unit participated in the intensive campaign of heavy bombers against the German aircraft industry during "Big Week," 20–25 February 1944. In addition to bombardment of strategic targets, the 305th Bomb Group often flew tactical interdictory missions and supported infantry units. Prior to the Normandy invasion in June 1944, it helped to neutralize enemy installations such as V-weapon sites, airfields, and repair shops. On D-Day, 6 June, the unit bombed enemy strongholds near the battle area. During Battle of Normandy the 305th attacked enemy positions in advance of ground forces at Saint-Lô in July 1944 and struck antiaircraft batteries to cover the airborne invasion of the Netherlands in September. After "Victory in Europe Day" (V-E Day), the 305th moved to Saint Trond Airfield, Belgium in July 1945 where it conducted photo-mapping flights which was called Project Casey Jones over Europe and North Africa. On 15 December 1945, the 305th moved to Lechfeld Airfield, Germany which it had bombed on 18 March 1944. The 364th Bomb Squadron was inactivated on 1 July 1946. The 423d Bombardment Squadron of the 306th Bombardment Group was attached to the group after this date but, by the end of October 1946, the group ceased all operations. Officially the unit was inactivated on 25 December 1946. On the Continent it was assigned to Ninth Air Force and inactivated on 15 November 1945. Not operational from 16 October to 25 December 1946. During two periods of activation (between July 1947 and September 1948, and, between January 1951 and June 1952), the group was manned only from 2 January to 9 February 1951 when SAC reorganized its wings into the dual deputate system. 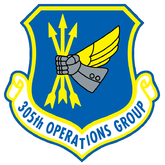 On 1 September 1991, the 305th Operations Group activated under the "Objective Wing" concept adapted by the Air Force as the lines between tactical and strategic forces blurred. The flying components of the 305th Air Refueling Wing were reassigned to the newly established group. The 1993 Base Realignment and Closure Commission directed realignment of Grissom Air Force Base, Indiana to the Air Force Reserve and the 305th OG phased out operations there in 1993. The Boeing KC-135R Stratotanker equipped 70th and 305th Air Refueling Squadrons were inactivated. In addition, the EC-135G/L radio relay aircraft as part of the PACCS system were also retired. 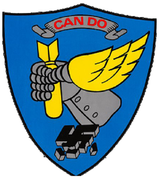 The 305th was reactivated at McGuire Air Force Base, New Jersey, replacing the 438th Operations Group on 1 October 1994. At McGuire, the group controls three squadrons of Boeing C-17A Globemaster III transports and McDonnell Douglas KC-10A Extender air refueling aircraft. ^ The group uses the 305th Air Mobility Wing emblem with the group designation on the scroll. Kane, Factsheet, 305 Operations Group. ^ Aircraft is Boeing B-17F-115-BO Flying Fortress serial 42-30647. On 23 September 1943, this aircraft crashed at Chevelston returning from a mission, killing all on board. ^ Aircraft is Boeing B-17G-60-BO Flying Fortress serial 42-102964. This aircraft survived the war and was sent to Kingman Army Air Field Arizona on 4 December 1945 for storage. ^ a b c d e f g h Kane, Robert B. (28 October 2010). "Factsheet 305 Operations Group (AMC)". Air Force Historical Research Agency. Retrieved 24 March 2017. Ravenstein, Charles A. (1984). Air Force Combat Wings, Lineage & Honors Histories 1947-1977 (PDF). Washington, DC: Office of Air Force History. ISBN 0-912799-12-9. Retrieved 17 December 2016. Wikimedia Commons has media related to 305th Operations Group.